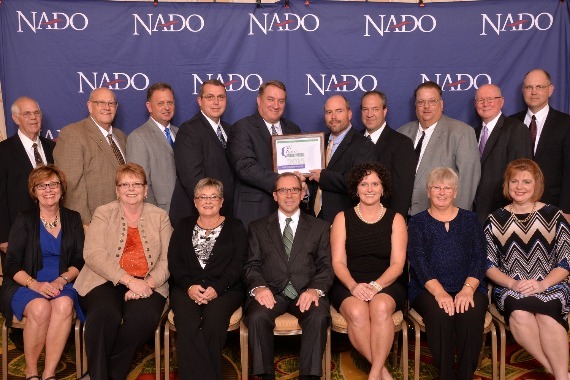 ​​WASHINGTON, DC – The Pennyrile Area Development District, based in Hopkinsville, Kentucky received a 2015 Innovation Award from the National Association of Development Organizations (NADO) Research Foundation for the Pennyrile Entrepreneur Network. The Pennyrile Entrepreneur Network is an organized effort to recognize and promote entrepreneurial success in order to develop an entrepreneurial culture in the Pennyrile region of Western Kentucky. The creation of strong partnerships and networks with multiple Chambers of Commerce and economic development organizations region-wide has led to an increased awareness of entrepreneurial opportunities. ​NADO is a Washington, DC-based association that promotes programs and policies that strengthen local governments, communities, and economies through regional cooperation, program delivery, and comprehensive strategies. The association’s Innovation Awards program recognizes regional development organizations and partnering organizations for improving the economic and community competitiveness of our nation’s regions and local communities. Award-winning projects were honored during NADO’s 2015 Annual Training Conference, held October 24-27 in New Orleans, LA. Development District in Alcoa, TN. For more information about the award-winning project, contact Amy Frogue at the Pennyrile Area Development District at (270) 886-9484.